Guide Dogs for the Blind, Inc.'s mission is helping the blind community by dedicating itself to providing the best quality training for guide dog puppies, educating society about Guide Dogs for the Blind, Inc. and being positive role models. Volunteer puppy raisers participate in many puppy raising projects which requires responsibility, dedication and the ability to encourage young pups to have good manners in public. The puppies are exposed to a variety of social situations in preparation for their future formal training as guide dogs. Puppy raising is an excellent way to have fun while being involved in community service. 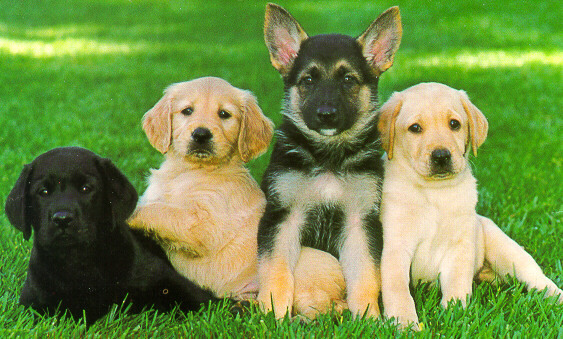 Adults and children nine years and older raise German Shepherd, Labrador Retriever, Golden Retriever, and Lab/Golden crossbreed puppies for the Guide Dog program. These pups have been bred from our specially selected breeding stock. When they are approximately two months old, the puppies are placed into the waiting arms of the dedicated raisers who will spend the next year preparing them for their special destinies. Guide Dog puppies sleep inside the house and are members of the family. House breaking and basic manners are taught at an early age. To prepare them for their future work as guides, they are exposed to grocery stores, restaurants, schools, malls, offices, etc. Each raiser is asked to bring their pup to local meetings with other raisers to work on training techniques. The dogs are returned to Guide Dogs campuses when they are between 12 - 18 months old for formal training with licensed instructors. After approximately five months of preparation, they are paired with blind or visually impaired students from throughout the United States and Canada. These students come to our school and spend up to a month learning to travel with their new Guide Dogs as teams. Their instruction begins in rural areas and progresses to busy city streets. When the training is complete, the students and their dogs are ready to graduate. At the graduation ceremonies, which are open to the public, puppy raisers present the Guide Dogs to their new partners. The contribution made by puppy raisers is paramount to the success of our dogs as guides. Puppy raisers help give the gift of sight. Guide Dog puppies are available for placement every month.